Geek Lit Etc. : Manga Monday: How many shinigami can one high school support? Manga Monday: How many shinigami can one high school support? 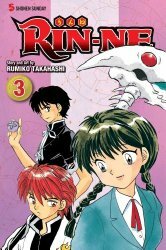 Rin and Sakura are back, and perhaps Rin has some competition in the shinigami business in Rin-Ne Volume 3. Note: Rin-ne Volume 3 is, of course, the sequel to Rin-ne Volume 2. The review for Rin-ne Volume 1 is here, and the review of Rin-ne Volume 2 is here. Otherwise, read on! There's another new kid in class, and it turns out that he's nearly as odd as Rin himself. Tsubasa, the son of a shinigami family, met Sakura years ago in grade school and even discovered that she can see spirits too. But Tsubasa-kun moved around a lot as his father followed the spirits he hunted, and Tsubasa left as quickly as he arrived. But he did have time there to decide that she was his first love. Now he's back and determined to win Sakura's love, even if he hasn't proven himself all that good at handling spirits so far. Our first ghostly issue has a crush on Sakura's friend Miho-chan. He had studied hard for the entrance exams to the high school Miho-chan planned to go to, but died just before classes began. Instead of using the holy ashes like Tsubasa, assuming that all spirits are evil, perhaps a date to the amusement park is in order. But exactly which people are couples together on this date? When Rin sees a wanted poster for a spirit with a reward of 100,000¥, he doesn't care WHAT kind of spirit it is, he'll get it figured out. At about the same time, a little-girl bathroom ghost appears at Sakura's school. This cute little girl has much more power than she should, though. Is there another spirit out there helping her, and is Rin in over his head this time? And finally, like every other Japanese high school out there, it's time for their cultural fair. What a perfect time for a damashinigami to appear! He's a shinigami who, to fill his quota of souls, lures in the spirits of people who aren't exactly dead yet. So when he finds a boy who has recently died and has a stack of love letters from girls in middle school, he steals the poor soul's face and uses it to lure these smitten girls to their death. Will Rin and Tsubasa unmask this vile damashinigami before he succeeds? Rumiko Takahashi has said in an interview that when she runs out of ideas for a story, she adds a new character. That certainly explains the enormous ensemble casts of Ranma 1/2 and Maison Ikkoku, but it worries me that we're getting quite so many characters so quickly. The story has so much potential, and so much of the classic Rumiko charm that keeps me reading series after series. Here's hoping that Takahashi finds her groove with this story and that Rin-Ne will run for dozens of volumes as well. Highs: Poor Rin trying to keep up with everyone else with his empty wallet at the amusement park. Lows: It seems like they're trying to insert a romantic triangle where there might not really be one. Verdict: It's nice to see some new faces, but not at the expense of the characters we've already become accustomed to.